Interested in cycling + technology + health? 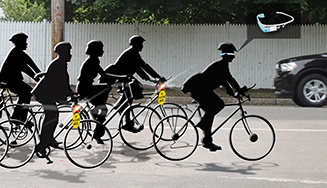 Our research group at Northeastern University in Boston, Massachusetts is looking for students, including potential PhD students, who would absolutely love to do research on novel technology to encourage active transportation via bicycling. This is a new transdisciplinary research project that will involve pulling together ideas from computer science, human-computer interaction, behavioral science, physical activity measurement and promotion, and “smart cities” infrastructure. Our research group works on sensor-enabled mobile health technologies (http://mhealthgroup.org), and this new project arose out of that work. We are working on building what we hope to be a very neat and useful bicycle simulator, as well as building prototypes of advanced mobile technology to support active transportation. The simulator will be used to conduct a variety of experiments on active transportation and include a bike, sensors, and large displays. We are instrumenting steering, brakes, shifters and fans, and then writing custom software to simulate biking in various environments. We'll also use commercial software such as Zwift if we can figure out how to conduct useful experiments with it. We are also interested in better understanding active transportation via cycling from a public health perspective. There are some projects for non-programmers in this space. Are you a student at Northeastern? If you are a student at Northeastern and might be interested in volunteering on this project, fill out this survey: https://goo.gl/forms/yWQUj8xkfRRcCOhk1. If you just want to stay informed about the project, contact us and we'll put you on a mailing list. Are you a potential PhD student? A PhD student could work on this topic by entering graduate school enter through either our unique PhD in Personal Health Informatics program (http://phi.neu.edu) or our more traditional PhD in Computer Science program (https://www.ccis.northeastern.edu/program/computer-science-phd/). We fully fund our graduate students. If you know of someone who is passionate about both computing and cycling, with a possible interest in research and doctoral studies, please let him or her know about our project and ask them to contact Prof. Stephen Intille. Alternatively, if you know of a mailing list or other electronic venue that people interested in computing and cycling read, it would be great if you could post this link.